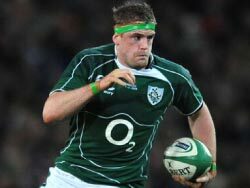 We at Dublin University Football Club would like to extend our congratulations to DUFC alumnus, Jamie Heaslip, who will become a test match centurion when he lines up for Ireland in tonight’s Six Nations match versus Wales. Jamie currently has 94 caps for Ireland, with five caps for the British and Irish Lions adding to his test total. He has been a central figure in Irish rugby since his debut in 2006, and continues to be a staple of the team today. Jamie was a standout for Trinity during his time here and played on the Trinity Colours Team from 2002-2005. We could not be prouder to call him one of our own. Congratulations Jamie and best of luck in tonight’s match!